The abductions of Amelia Earhart and Antoine de Saint-Exupéry. Dear professor: Among the many mysterious disappearances unexplained are those of Amelia Earhart and the writer Antoine of Saint-Exupéry. There many hypotheses about this issue, but until now nobody has been able to solve these mysteries. I would like to know your opinion about this matter. Appreciated Carlos: The cases you mention have already been answered by our spiritual Guides, and the answer in both cases is that they were extraterrestrial abductions, in one case was a voluntary abduction and other was forced. Interlocutor: What happened to the famous aviator and writer Saint-Exupéry who disappeared with his airplane and was not found again? Was it an extraterrestrial abduction? Tar: His disappearance cannot be called an extraterrestrial abduction because it was voluntary. His destiny was to be living many years more than those he had lived here on Earth. In another world of Light, teaching. At this time he is a spiritual hierarchy of the 5º level... Before retiring I want to finish with the topic of the abductions... More than 50 years ago, different investigators of your planet discovered how to break down the energy field that protects to space ships from many of the worlds which travel through the hyperspace. Most of the ships that travel through the hyperspace have a common characteristic; they have an energy field of protection like the ship of the entity that was before, called Langar that destabilized to this vessel. Then, that technology was lost. The country you called Germany had that technology before. The United States, due to an accidental circumstance have rediscovered it, because they could capture a ship of those beings that you call "locusts." They could also discover other type of technologies, even a device that can cure that tumor you call "cancer." Interlocutor: And why don't they spread out that technique? Interlocutor: See you later, Tar, and thank you to be with us. Interlocutor:. What happened with Amelia Earhart? Ruanel: She was abducted by extraterrestrials and taken to another planet which is located thousands of light years using a technique that consists on going through the space by a tunnel that the terrestrial scientists call worm holes, and she was left there in suspended animation. Interlocutor: Was it due to Karmatic reasons? Ruanel: No, it was not related to karma. She was taken to another world and they simply left her there in suspended animation. Then the aliens who took her had wars with beings from other planets and those humans, I pluralize because there was more than one, they had a civilization which was descendant of Amelia Earhart. Interlocutor: When you say “suspended animation”, what does it really mean? Ruanel: She was cryonized during some years and then she was defrosted to perform different biological exams. Interlocutor: Forgive me if I insist, but she was abducted without any relation to karma, simply for mere coincidence? Ruanel: Correct. And those beings that abducted her never returned to that planet where they left her and other human beings, also kidnapped. Interlocutor: How many were they? 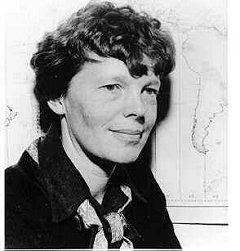 Ruanel: Around 20 or 30, who had offspring , in the future since we can see further on, it will be hundreds of people, and thousands of people, descending of those humans and that first woman, Amelia Earhart, she will be like a legend. Interlocutor: Could we communicate with her in other time so that she relates us her odyssey? Interlocutor: Another question Master, please, before you leave... About Glenn Miller’s disappearance, the famous musician, it is said that he disappeared with the airplane in which he was traveling? Ruanel: Well, Glenn Miller didn't disappear with the airplane like it was murmured. Glenn Miller, although he loved his wife, was a philanderer and his death was due to a heart stroke he had in a cabaret of Paris. Ruanel: It is a pity that he had died in this way because he was a very dear figure. Books have been written about his life, but the reality is that he died in this way. The belief that he disappeared would have been something like a happy ending, but the truth was another. This doesn't remove nor fail to deserve his altruism. Ruanel: Correct, but the enigmatic disappearance has been fomented in order to not demystify his image. Interlocutor: Is it something similar to the famous cryonization of Walt Disney, just to make believe that he is alive, with the purpose of increasing his image and charisma? Good, I believe that these disappearances have been definitively clarified. Welcome to the Club. A strong hug. Have the remains of the aviator Saint Exupéry been found? Dear professor: Antoine of Saint Exupéry transferred to another planet?.... Pity that some of his remains have appeared and it has been confirmed that it is his body.... but it doesn't matter does it? The question is to hoodwink. Appreciated Americo: In your desire of discrediting the Masters of Light, you have discredited yourself. The Masters of Light never make a mistake. What was found were the remains of the airplane, not his body. Found remains of the airplane of Saint-Exupéry. Remains of the pilot's airplane and French writer Antoine de Saint-Exupery, the author of 'The Little prince', have been found in front of the costs of Marseilles (southeast) 60 years after his disappearance, informed “ Le Département des recherches archéologiques subaquatiques et sous-marines” (DRASSM). Saint-Exupery disappeared on July 31 of 1944, after leaving from the island of Corsica on board of its Lightning P38 for a recognition mission dedicated to prepare the allied landing in Provenza. A piece of the airplane, located to the east in the island of Riou, the same place where a fisherman had found in 1998 a bracelet with the aviator's name, it has been formally identified as belonging to the apparatus of Saint-Exupery, according to DRASSM. The airplane fell in the area of Roiu, according to the conservative boss of patrimony of DRASSM, Patrick Earns who assured that the discovery of the remains of the airplane doesn't solve the mystery of the accident. "It is not known why it happened and we probably never know" , he added. Saint-Exúpery wrote, among other memorable works, 'The Little prince', translated to 118 languages and one of the best sellers in the world. This entry was posted at Saturday, April 25, 2009 and is filed under Missing Persons . You can follow any responses to this entry through the .